This one is a MUST for parties -- our friend Ryan told me to say it has his "Seal of Approval!" *Of course, you may make your own guacamole if you feel inspired, but if you're pressed for time, pre-packaged guacamole will do "in a pinch." 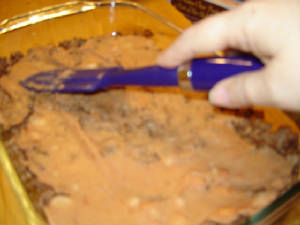 ** Low fat refried beans work very well. Remember, there is no need to rely on any certain brands of these products -- use YOUR favorites and it will be YOUR recipe! 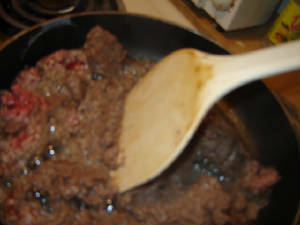 Spread the ground beef in a large skillet and brown thoroughly. We want the ground beef to be nicely browned. I find that it is not at all necessary to add salt at this stage for a couple of reasons. First, the taco seasoning that will be added shortly already has its share of salt. Second, the chips you will be serving with the dip will have a coating of salt on them, as well. While the ground beef is browning, use your spatula to separate it into the smallest parts possible. 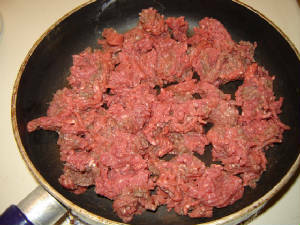 Once the ground beef is browned and chopped up into small bits, drain off all the grease. Hint: a turkey baster works quite well for this task, but if you don't have one, just spoon the grease off and discard. 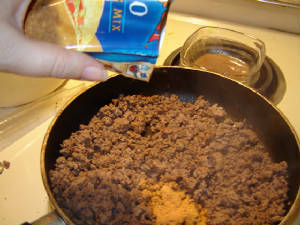 Stir in approximately 1/2 an envelope of taco seasonings, stir so all ground beef is coated. 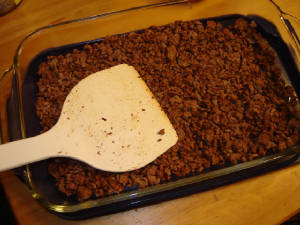 Press the ground beef into a 7" x 11" dish. (Glass is nicest so your guests can see all the layers). 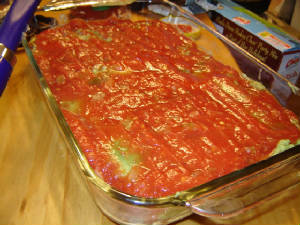 Place the ground beef in the refrigerator for about 15 minutes so that it can chill slightly. You don't want it to be hot or it might cook the remaining ingredients. 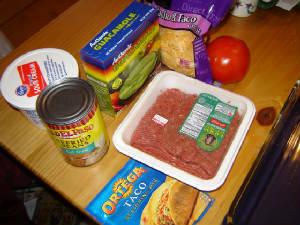 Once the ground beef is chilled, remove from fridge and spread the refried beans on top. Spread guacamole on top of the beans. Spread the salsa on top of the guacamole. 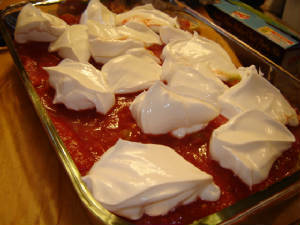 Place dollops of sour cream on top of the salsa and then use your spatula to spread it. The sour cream will not really spread into a perfect layer but do the best you can... Once the layer of shredded cheese arrives, you won't know the difference. Be sure to top with lots of shredded cheese -- it automatically adds to the eye appeal of your dish and then scatter the seeded, diced tomato bits on top. While they are mostly there to be pretty, you'll find them to be a tasty addition. This can be served immediately, but you may make it a day ahead. Make sure there are plenty of sturdy taco chips handy for dipping and then stand back for the stampede. 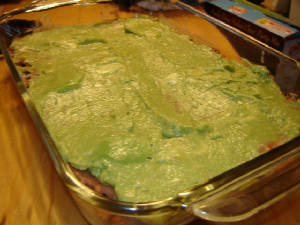 Also note: I have "converted" several people who thought they hated guacamole with this dish. They found it was in here and they liked it. I personally really adore guacamole and avacadoes in general, and believe that they do, indeed, add quite a lot in their subtle, creamy manner. If you find you simply can't tolerate them, or any other ingredient on this list, you can feel free to omit it and move on -- you'll still have fairly good results. 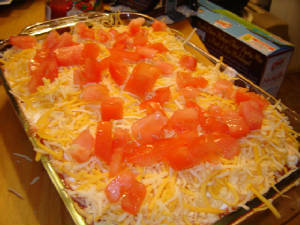 Other items you may wish to add could include a thin layer of shredded iceberg lettuce under the cheddar cheese layer or some black olives on top with or without the tomato cubes.